Ramona Beltrán’s (Yaqui/Mexica) scholarship focuses on the intersections of historical trauma, embodiment, and environmental/social determinants of health as they affect health and risk behaviors in indigenous communities. 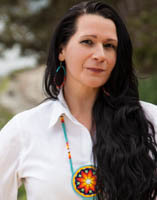 She is particularly interested in centering cultural protective factors, strengths and resiliencies in indigenous populations as they work to interrupt the intergenerational transmission of historical trauma. She uses decolonizing methodologies with an emphasis on qualitative methods that incorporate innovative geo-spatial, photographic technologies, and digital storytelling to support community-based research.